Houston, Texas: June, 2000- The Model 7090 Nitrogen/Sulfur Chemiluminescence Detector (CLND/SCD) from ANTEK Instruments is the only simultaneous nitrogen/sulfur chemiluminescence detector for GC and SFC. One injection - two results. It has a single flowpath with dual chemiluminescence detection, saving time, benchspace, and money. Add to your FID for one injection - three results. The detector provides equimolar response for all nitrogen and sulfur compounds respectively. This facilitates calibration and quantitation of unknown compounds. Linearity over four orders of magnitude and detection in the low ppb range make this a powerful, multi-element GC detector. Features include electronic mass flow controllers for all gases and individual electronic setpoints for all parameters (oxygen, ozone, PMT voltage, gain, etc.). The 7090 is also available with a single detector (nitrogen or sulfur), and a second detector can be added later. 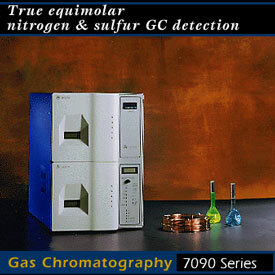 The Model 7090 fully integrates with most gas, supercritical fluid, or SimDis chromatographs.